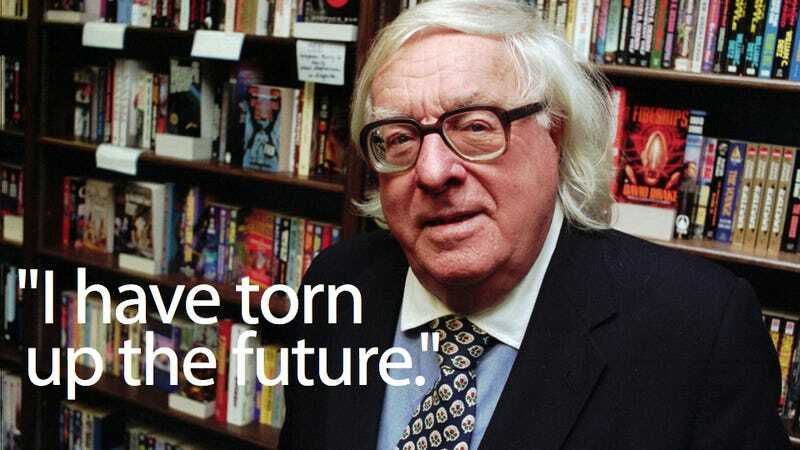 We're still mourning the loss of legendary science fiction writer Ray Bradbury. The author of The Illustrated Man and Fahrenheit 451 has passed on, but his indelible writing will remain with us forever. And what better way to commemorate the legacy of Bradbury than with his own words? Bradbury claimed to have typed out over 200 articles and letters a week, keeping in touch with fans, defending libraries and sticking up for Disney's humanoid Robots. We've collected a few of our favorite Bradbury letters that show his passion for writing, but most of all his generosity to his readers. "I Have Torn Up The Future!" Teacher William Stanhope pulled together a collection of responses from famous authors as to how they overcame adversity in their lives, asking them to describe one obstacle they faced from their past. Bradbury's answer will melt your heart. Written in 1991, and discovered over at Letters Of Note. "Good symbolism should be as natural as breathing… and as unobtrusive." In 1963, 16-year-old science fiction writer Bruce McAllister's English course focused on "symbolism" in literature. Looking to further flesh out this study, McAllister wrote to 150 of the most famous writers of the day, asking them about symbolism in their work... including Ray Bradbury. These were his answers. You can read the whole letter here. "I'll toss you in the Jungle Ride River and ride you on the train into tomorrow, yesterday, and beyond." Writer and Broadcaster Brian Sibley has a very special relationship with Bradbury. In 1974 Sibley wrote the author a fan letter, and Bradbury returned. And they kept writing each other letters for over six years. This two page letter is our favorite in which Bradbury lovingly challenges Sibley's fear of Disney robots and trepidation with Disney world all together. Sibley later visited Bradbury at Disneyland (among many other visits). "All of my loved ones were on the shelves"
Then there's this gem, also discovered by Letters of Note, in which Bradbury explained how the local library assisted in the creation of Fahrenheit 451 and the Fireman novella. Ray Bradbury's latest work (which is kind of like a letter) "Take Me Home" has been released to the public over at The New Yorker. Go and read it now! Also, some of Bradbury's greatest stories are available online, including the simple and heartbreaking "The Homecoming," the amazing nursery story "The Veldt" (and here's Stephen Colbert reading it), the time travel classic "A Sound of Thunder" and the "automated house" story "There Will Come Soft Rains." And if you haven't yet, please share your thoughts on how Bradbury's life changed yours.